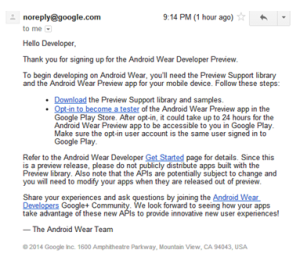 Google recently announced the Android Wear Developer Preview. It is designed for creating wearable experiences for existing Android apps that may appear on forthcoming square and round Android wearables, like watches. 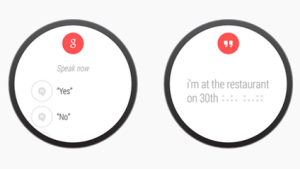 You can customize and extend notifications using Android Wear APIs. It creates a standard user experience for wearable devices connected to Android powered smartphones. A good starting point to understand how wearables could work is this YouTube Video produced by Google. 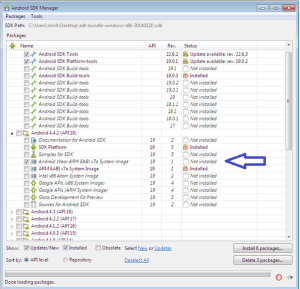 Note: If your version of Android SDK Tools is lower than 22.6, it will need to be updated. 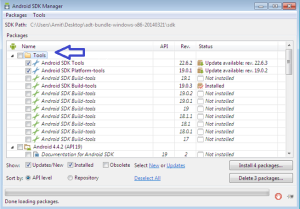 Go to Packages and select Android SDK tools. 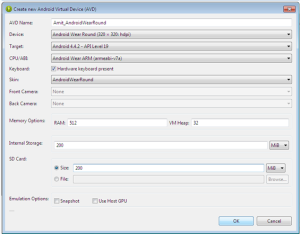 Below Extras, ensure you have the latest version of the Android Support Library. Update it if newer versions are available. 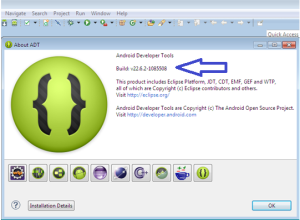 Also select Android Support Repository, if you’re using Android Studio. 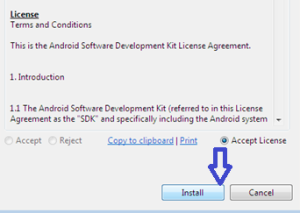 As shown below, click Install packages, Accept the license and click Install. 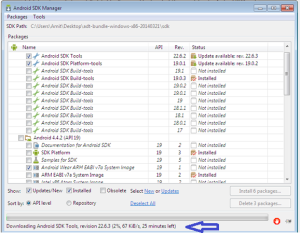 Restart Android SDK Manager when installation completes. 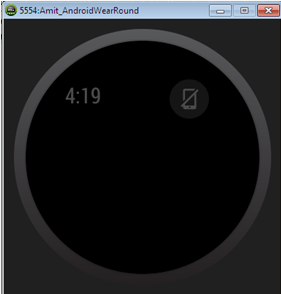 To set up an Android Wear Emulator, create a new Android Virtual Device (AVD) for Wear using the system image just downloaded. There are two skins available, Round and Square. I have used round here. 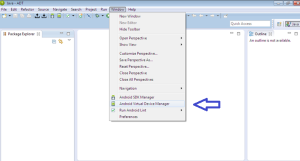 Launch the Android Virtual Device Manager. 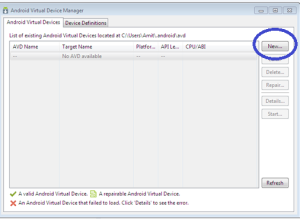 From Eclipse, select Window > Android Virtual Device Manager. Device: Select from Round or Square, I have selected Android Wear Round (320 x 320: hdpi) to simulate a ‘watch’. 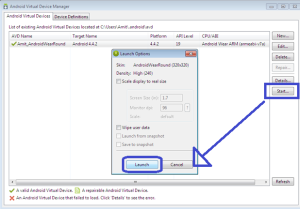 CPU/ABI: Android Wear ARM (armeabi-v7a). Keyboard: Keep Hardware keyboard present selected so you can provide text input instead of voice input. Select and click Start. The window “Launch Options” will appear, click Launch. 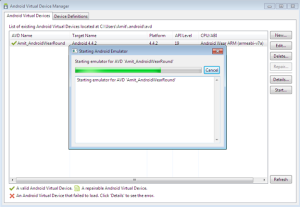 Now, after clicking Launch wait for the Android Emulator to load. The Android Wear emulator will now start. It will look like the one pictured below. The time and disconnected phone icon seen here in the Emulator are nothing to worry about. It shows that emulator is not connected to a phone. This is an indication that you’re following the steps correctly. 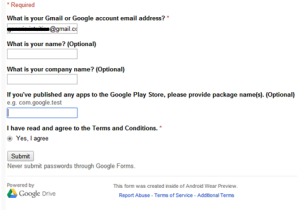 Sign up for the Developer Preview using a Google account. 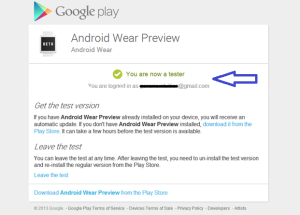 A link to opt-in to the Android Wear Preview app beta program. Once you opt-in, it may take up to 24 hours for the app to become available in the Play Store. You’re now successfully registered as a Tester. It may take up to 24 hours for the app to become available in the Play Store. Login from the same account used above and download Android Wear Preview app as shown. Open the Android Wear Preview app, it will currently say “The app is currently not enabled as a notification listener”. Tap the message to open the system settings. 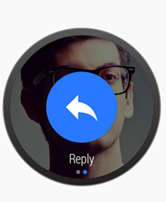 To grant it notification access, select Android Wear Preview. Use USB to connect your device to your development machine. 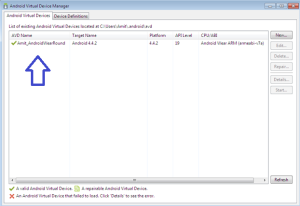 Ensure that the Android Wear Emulator is running, i.e. the one we created earlier. The emulator should be in the same state, showing the time and disconnected icon that indicates no device is connected. Open a command line terminal, navigate to your Android SDK’s platform-tools/ directory and execute the following command (Remember that this command is to be executed each time you connect your device over USB). Next, return to the Android Wear Preview app. 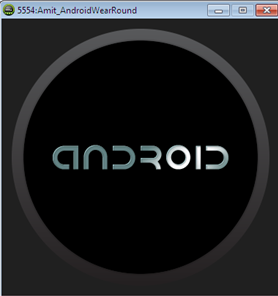 The Android Wear emulator will now show the ‘g’ orb icon, indicating that it is paired to your Android Device. 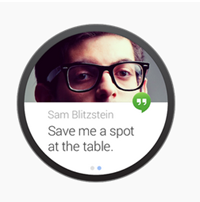 Now, notifications from your device also appear in the Android Wear emulator. 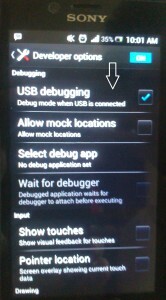 After this setup you should be able to see Notifications on the Emulator. As a simple example, try calling your phone and observe what happens in the wearable emulator. Shows vertical list of cards. Each card shows potentially useful information. One card is displayed on the screen at a time. Additional visual information can be provided by background images. If a card is not in use, it can be removed by swapping from left-to-right. The cue card is opened by voice input such as, “Ok Google”. It can also be started by tapping on the “g” icon on the home screen. It allows users to speak to their device. Swiping up on the cue card shows a list of actions. 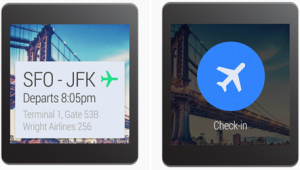 Notifications are a core component of Android Wear. They should reflect the urgency of a notification with priority. Time-sensitive notifications carry high priority. Appear to the right of your notification. A maximum of three actions are allowed. An action consists of an icon and a caption. Captions should be kept short. Use pages to provide additional content and information instead of packing information in primary notification. Pages appear immediately to the right of the main notification card. It could be a next train departure card, a card showing the weather forecast, scheduled matches etc. Provides a hands-free method of dictating a short message. Used by messaging applications and suggested to be used to cover a range of simple, neutral replies in the choices you provide. Five suggested replies can be provided. Creating custom card layouts and running activities on wearable’s directly. Enabling sending data and actions between the wearable and phones with data replication APIs and Remote Procedure Call (RPC). The ability to gather sensor data and displaying it in real-time on Android wearables. Android’s partnership with different vendors to launch devices powered by wearable. Further examples provided by Android wearable will be discussed in my next Article which will include creating notifications, receiving voice replies and more. Until then just give it a try by signing up for the Developer preview and following the above given steps.